If you love a minimalist aesthetic, then you’re going to love the K Workstation by MisoSoupDesign. A full-on workstation complete with desk, shelves and a place to set your keyboard, this masterpiece was bent from bamboo laminate plywood and is even available in various segments so you can fashion your own final arrangement. An awesome and eye-catching design, the K Workstation is also a great way to save some space in a cramped room! Correction: With my real heavy books overhead, I do not think IT WILL BE heavy enough to counter balance and support the weight. Good concept that anybody could develop to a more realistic application. Ergonomically,this workstation is only suitable for a certain group of people. The height of the bookshelf and the computer desk can be a hazard to taller population. Especially at workstation, it is essential for furniture such as table and chair to have adjustable height, back & arm supports. Bad ergonomics would lead to reduce in productivity, injuries and dissatisfaction of the users. Meh. This system lacks the proper ergonomic corrects needed to make a computer workstation a healthy proposal. The desk height on this system would be limited to a small range people. At work, I use an old drafting table as a stand-up desk. As a result, not only is my whole body doing low-impact work (standing for 4 hours) which has helped to alleviate my back pains, my wrists are at the proper angle for maximum comfort and long-term health. The desk does look neat, but it is an ergonomic disaster waiting to happen. If you love a minimalist aesthetic, then you're going to love the K Workstation by MisoSoupDesign. A full-on workstation complete with desk, shelves and a place to set your keyboard, this masterpiece was bent from bamboo laminate plywood and is even available in various segments so you can fashion your own final arrangement. 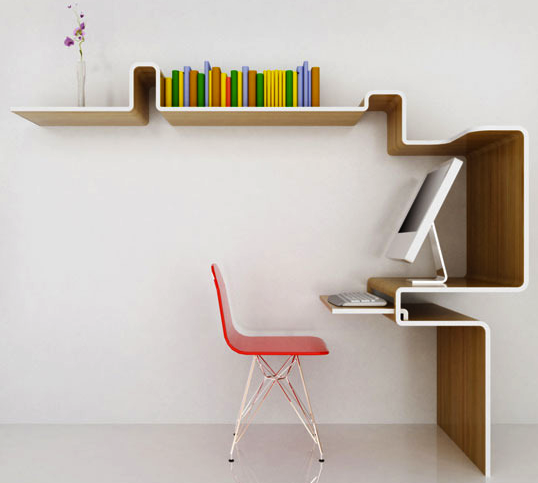 An awesome and eye-catching design, the K Workstation is also a great way to save some space in a cramped room!